At the 2017 TOCA Annual Meeting, Lisa Lochridge shared tips and information about preparing for a media crisis. 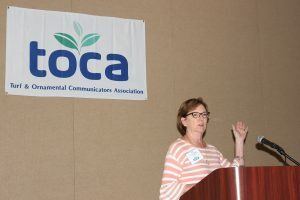 A former reporter and editor for the Orlando Sentinel, and a former PR professional in Maitland, Florida, Lochridge is now Director of Public Affairs for the Florida Fruit & Vegetable Association. Successful crisis management requires early detection, free flow of information within the company and a good plan. Goals should include protecting public health, safeguarding quality and value of product, protecting your brand and returning to normal operations as quickly as possible, thereby shortening the life cycle of the crisis. Lochridge recommends developing a list of key responsibilities, creating a checklist for the first 24 hours and updating contact information for all team members. Responsibilities should include media monitoring and developing a phone script and call log for the receptionist. Know your objectives, decide on the most important points to get across and develop two or three ways to say them. Decide what you don't want to say and what you will say only if asked. An apology is a critical part of crisis management --- if warranted. But there are right and wrong ways to apologize. Don't do what the BP CEO did and make it about yourself. A good apology should express authentic regret.